Disclaimer: I was given free admittance into Go Ape for the purposes of this review, but all words, thoughts and opinions of how amazing this place is are truly my own. 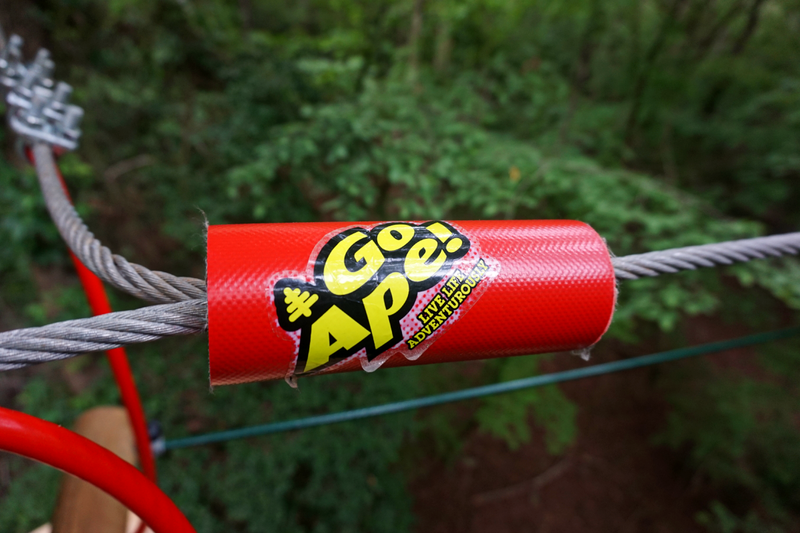 I stand firmly by the fact that Go Ape is literally the best thing since sliced bread. Question of the day: What do you get when you have multiple bloggers dangling from a rope more than a hundred feet in the air? Answer: A darn good time. 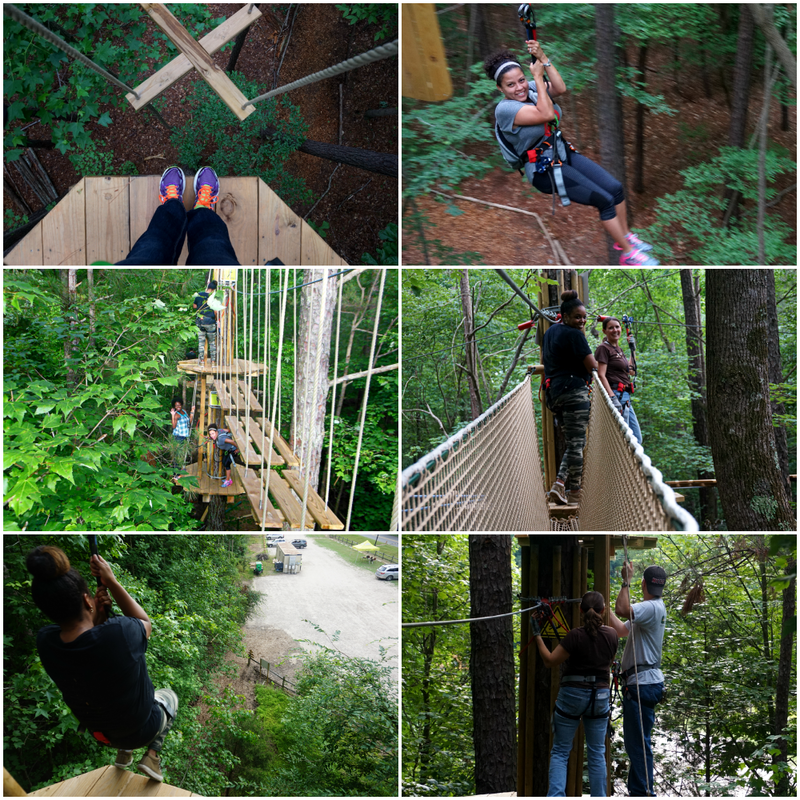 Yesterday afternoon, some lovely local bloggers and I had the opportunity to "Go Ape" at Go Ape of Blue Jay Point in Raleigh, North Carolina. It was a meetup unlike any other. The stakes were high, but those trees were even higher. First off, before I get lost in the insanity that ensued yesterday, I cannot say enough good things about this place. Seriously. I'm not trying to sell you on anything, but Go Ape is literally worth every penny. In fact, they are worth all the pennies. By the time I made it up my first tree I had already mentally rearranged some of our vacation fund to go towards purchasing some sort of annual pass at Go Ape. The staff is beyond welcoming. They are friendly, charismatic, and most importantly they know their stuff, which is exactly what you want when you're going to be dangling 100+ feet in the air attached to a rope and harness. Safety is extremely important. So when you arrive, expect to spend at least 30 minutes getting properly fitted for your harness (hello awkward moments) and practicing before they will allow you onto the course. Again, this is a good thing. Most importantly, pay attention. I managed to snap a few shots of our instructor, and "tribe" as we practiced, but I decided paying attention to how not to plummet to my death was ultimately more important than getting a perfect shot. Another few things to remember: Dress for the occasion. I failed to do so. I forgot to change on my way out the door, but luckily the course is completely shaded by trees and we are experiencing a unusually cool June. You should definitely wear sporty, loose attire. Tennis shoes and sneakers are a must. No flipflops or sandals are allowed on the course for obvious reasons. You can take your camera with you, but it has to be attached to your neck at all times. And you may want to leave your ultra-expensive DLSR in the car. Kids are welcome, but they have to be at least 10 years old and at least 4 ft 7 inches. They also have to be accompanied by an adult who is at least 18 years or older. One adult can only supervise up to two children. Now, back to the insanity. There's something to be said about going into battle with a group of people. Before we arrived, I had not physically met any of the three other bloggers who accompanied me on our treetop adventure, but before we left, I felt as though I had known these ladies for years. I suppose you learn quite a bit about a person while your hanging a hundred feet in the air. I'm a bit of a thrill seeker. I suppose that's what happens when you're married to a guy who was once paid to jump out of planes for a living. I've gone ziplining, whitewater rafting, rock climbing, skydiving (okay, it was indoors, but it still counts! ), but this was a truly unique experience. It really tests you mentally and a bit physically (hello Michelle Obama arms). But most importantly, it allows you to connect and trust people on a deeper level. I was afraid the people behind me on the course would be upset if I took too long, but they were so supportive. When we saw one of our comrades struggling, we stopped to ask if they were okay and encouraged them. We clapped and cheered for each other as we zipped down the zipline. It was the ultimate team-building exercise. 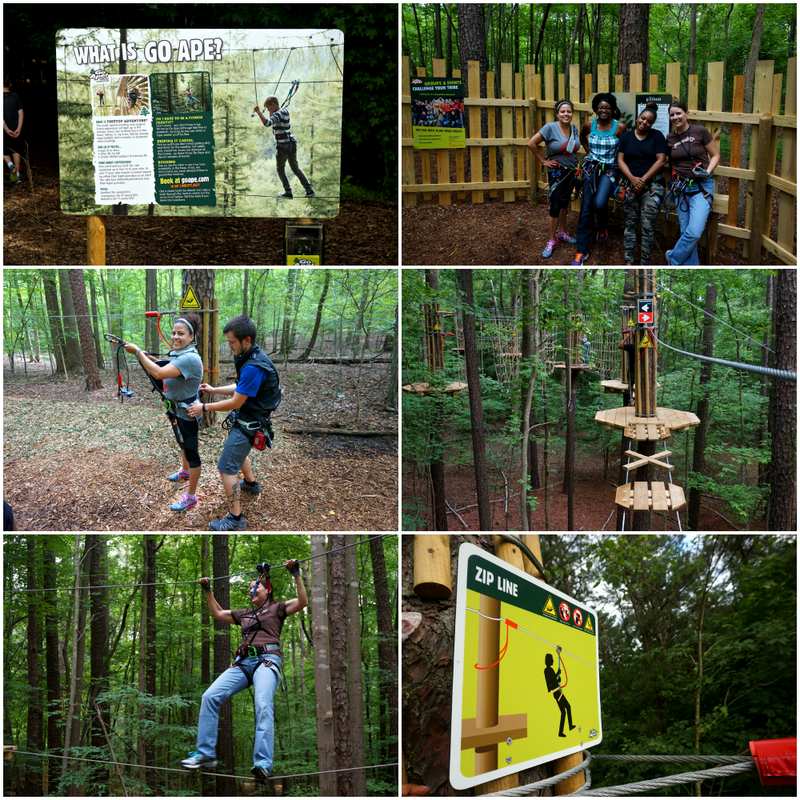 Go Ape has several locations throughout the US, including one in Raleigh. They can accommodate groups of 1 to 100+. 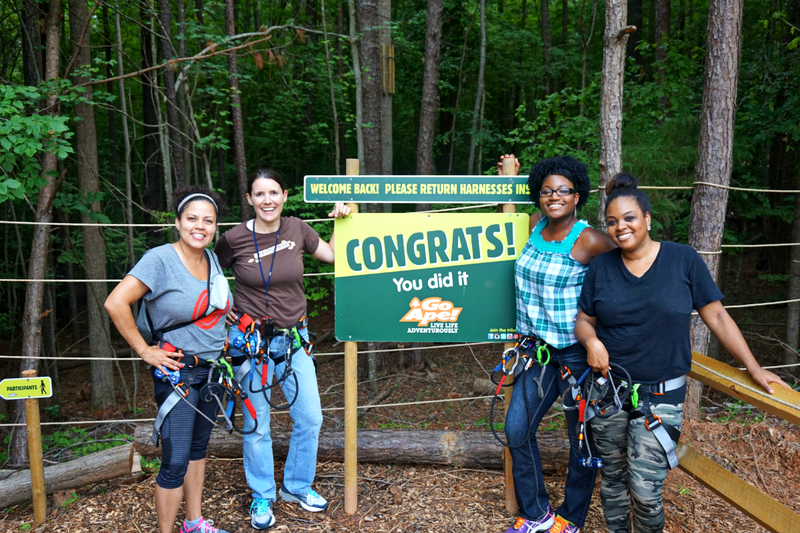 If you're looking to do date night a bit differently, want to challenge yourself mentally, or are scouting out a place to host a corporate retreat, you need to check out Go Ape. I'll be sharing more photos of the event throughout the day via my Instagram and Twitter. A very special thank you to the lovely staff at Go Ape for graciously allowing up to take over your course. I look forward to seeing you guys again very soon! Want more behind the scenes pics of our time at Go Ape, check out my fellow comrades, 2 Paw Designs, Mommy This and That, and Essense Heel for their recaps! Definitely a fun time and a date night win says the couple who finally got a kid-free date for the first time in nearly 8 months! This was wonderful. Thanks to you & Go Ape for setting us up for a super fun afternoon. I'm definitely interested in going again. It was so nice to FINALLY meet you in person! Let me know when you're ready to go back. I've already told Mr. A we're going (with or without his consent) So we can do a double date night! Happy you had fun. This was definitely one for the books! Glad you all had a great time. This looks and sounds like a fun place to tap into your adventurous side! It was! My adventurous side was VERY impressed! The hubby and I are already planning a return trip! They're building a kiddie course, so it will be perfect for your little ones! I would love a place like this! How fun is that! Oh my goodness that looks like so much fun! Wonder if I would think it was that much fun while I was doing it? I know my husband would LOVE it! Oh my gosh, this looks like a blast! I wish we had this close by. How fun! I bet all the kids and families in our area would love it to. Definitely planning a trip to try it out! This looks completely AHHHHH-MAAAAZING! I'm a risk taker gal, too and would absolutely try this! I'm off to check out their site and see where the closest location is in relation to our Summer travels!!! Oh my gosh! How fun! I would love to go to this! How much fun does this look and I bet your confidence soared after this achievement! They have one of those here and I'm scared to death of those things. It does look fun!